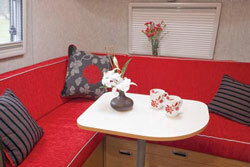 The Bambi cleverly squeezes an end-washroom two-berth into just 4.14metres. How? The lounge, from which the double bed is made, is L-shaped. There’s plenty of floor space – and the central freestanding monopod table is easy to pick up and use outside whenever you wish. The door is offside, alongside the kitchen, and the fridge is opposite with a top ideally placed for your television. Climb aboard and you’ll immediately notice its minimalist styling. Stark red upholstery, white furniture, grey floor, metal-effect roller blinds on the wall lockers, bold red and black cushions. It’s not just the décor that makes the Bambi different, of course. 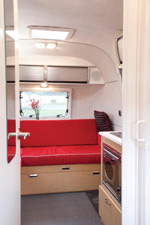 Inside, you feel, as well as see, the effect of the Airstream’s curved shape. It cocoons you in a cosy environment. 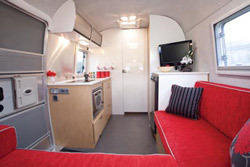 Cosy, maybe, but the amount of floorspace in such a small caravan is amazing. Equipment includes a water tank level indicator, Alde heating with programmable timer, fly blinds, door blind – and (a £900 optional extra) pull-out awning. The word “extreme” can be used to describe a lot of the Bambi’s features. Its drawbar is extremely long, which goes a long way to explain the extreme stability on the road. And those rivets that are such a prominent feature of the styling seem to punctuate the whole structure, accentuating its aircraft-like lines. By now, with so much talk of “solid” and “chunky” you could be forgiven for thinking the Bambi is heavy. You’re in for a surprise – its MTPLM is only 1320kg. In the kitchen area you have two burners plus a Smev combination oven-grill. You have a circular sink – and just a small amount of working surface. Kitchen storage space is excellent. Under the sink is a double-door cupboard; there are two more cupboards at floor level, one of them under the oven. The style goes on: speakers are white, mounted into the sides of the front locker assembly. Locker fronts are slatted brushed steel-effect. 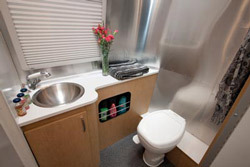 There’s more style in the delightful end washroom that’s amazingly large for such a compact caravan. The shower itself is enormous – and incorporates a seat into the plastic moulding. The Bambi offers an extremely comfortable and cosy environment. It’s only 1320kg – but whether it’s worth a price tag higher than any conventional caravan you have to judge for yourself. But ask yourself where else you can get this amount of iconic, ultra-modern head-turning style on wheels in just 1320kg. 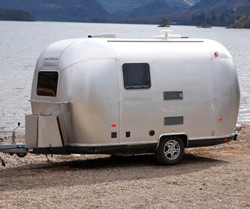 *Caravan Insurance cost based on 2009 Airstream Bambi 422 valued at £29,950, fitted with hitchlock, wheelclamp, plus approved caravan tracking device. Kept on drive behind locked gates at HX2 7RZ. Caravanners over 30 years old, claim free for 3 years and a member of a caravanning club. Premium includes insurance premium tax at 5% and is correct as of 09.10.09.